You would expect such advanced technology to be at the high end of the cost scale. Not so through AuDNet. Sebotek products are available in the low $100's, and the price includes a two year warranty. 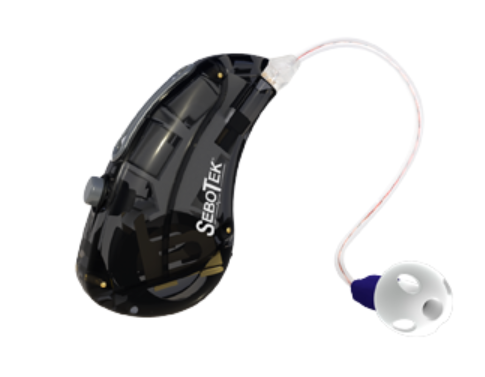 Sebotek Hearing Systems is a fast-growing, privately held company that has revolutionized the hearing aid industry with its patented receiver-in-the-canal (RIC) technology. SeboTek hearing instruments provide the widest spectrum of sound reproduction in the hearing aid industry -- up to 14KHz and 111 HD processing channels that automatically adjust to the user environment for the best hearing experience possible. Today, SeboTek's patented RIC technology has become the fastest growing hearing aid product style worldwide. 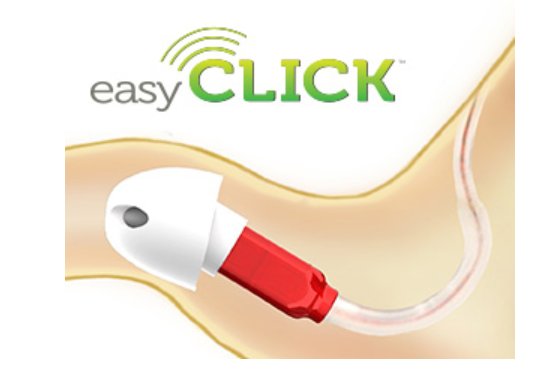 easyCLICK tips are an essential part of a patented comfort technology. This unique design creates an ultra-soft and gentle fit in the ear canal resulting in an open and natural feel. People often forget they are wearing them. There is good rational behind encouraging all audiologists to embrace the entry-level market with products that compete with PSAP's, but are aligned with the professional skill and expertise of the audiology provider. Open Book GPO (a division of AuDNet, Inc.) members continue to enjoy access to numerous FDA approved products - as well as PSAP products - from several popular manufacturers. All with extended warranties - in a variety of forms and at prices recently suggested as unavailable to audiologists. All this from a well established network with a pretty impressive track record of financial contributions to ADA. Take this fresh look at what we do and join. Our APO webinar pledge drive was concluded after the first quarter of 2015. Unfortunately, we were unable to generate sufficient pledge purchase commitments to represent enough additional buying power to negotiate significantly better pricing value for our members. As such, AuDNet will continue with our current contract value, which offers helpful pricing for many practices, while exploring new vendor partnerships and new recruiting strategies going forward. Habit and intertia are tough human elements to overcome, even when there is the potential for not only significant savings, but significat favorable influence on an industry so driven to promote product at the expense of valuable professional care. We are not deterred, however. We will continue our effort to harness the "power of numbers" and direct that power toward the best interests of the audiology profession and the patients it serves. A lot has been happening over the last two months in regards to our APO model launch, and we wanted to provide you with the latest update and information. AuDNet maintained a notable presence at this year's ADA convention at the Red Rock Resort in Las Vegas. Probably one of the better attended ADA conventions in recent history, AuDNet representatives manning AuDNet's booth had the opportunity to discuss the APO business model, and sign up additional audiology professional's who are committed to participating in this unique effort at securing better cost parity for audiology praxtitioners. Dave Smriga, AuDNet's founder and president, was one of many outstanding speakers on ADA's program. His talk, "Who Are You Really Working For? The Complex New Relationship Between Audiology and Manufacturing" educated attendees about the history of our industry, group purchasing organziations (GPO's) as they are used by most hospitals and clinics to lower costs, and the opportunity to establish an audiology-centric GPO (an APO) to help lower costs for audiology practitioners. Particuarly interested in and enthusiastic about this model were the up-and-coming generation of audiology practitioners, who are truly invested in audiology's future. For those of you who have attended our APO webinars this past summer, you will be interested to note that we have changed our funding model from the subscription model ($100 per month per practice location) to a 3% vendor fee model, consistent with the historic GPO funding mechanism recognized and supported by federal regulation. Through this funding source, NO fee will be required from any APO participant. After securing meaningful discount pricing for our members from participating manufacturers, AuDNet will in addition receive a fee of no more than 3% of the discounted price paid by our members as the income source to run the APO operation. This is both a major shift in the funding source, as well as a major departure from the funding amount more commonly collected by buying group organizations within our industry who do NOT operate as GPO's. To date, we have identified nearly 600 practices who have either joined or pledged to join Open-Book APO and commit their purchasing levels to the purchasing volume we will reference when negotiating contracts. This is not yet our 1000 practice goal, but is close. So, we intend to continue our recruiting efforts through the first quarter of 2015 in an effort to pump up our negotiating numbers some more. In addition, we are inviting other buying group organizations interested and willing to follow our GPO business model to "join forces" with us, adding their purchasing levels to the total, and further increasing the opportunity to make this approach truly competitive in the new world of diversified hearing instrument distribution and availability. If you have not already done so, join or pledge your purchasing to the Open-Book APO initiative. You have nothing to lose -- no costs to absorb -- and everything to gain in terms of leveling the cost playing field of hearing health care. Tell any of your colleages not aready engaged to join, pledge or learn more. We will be conducting webinars regularly throughout the first quarter of 2015. Go to www.AuDNet.com to register for a webinar, join Open-Book APO, or pledge your buying power to Open-Book APO's negotiating strength. With your continued participation and commitment, we indeed can make a huge difference in addressing one key issue important to sustaining audiology's future; as much cost parity as our collective purchasing can secure for all audiologists going forward. Our marketplace is changing. AuDNet is compelled to change with it. AuDNet 2.0 completely re-writes the group purchasing organization model, offering opportunity for professionals caring for the needs of patients with hearing loss. AuDNet 2.0 is focused on providing Audiology practices in any setting with competitive cost of goods, complete transparency of operations and accountability to its membership. It represents the best in proven group purchasing organization operations. May 2014 -- ATTENTION INDEPENDENT AUDIOLOGISTS: Your Audiology Provider Organization (APO) Membership Application is HERE! Click on the red "Click Here" button below and submit your application TODAY! Don't delay! Your colleagues are counting on you. Your application makes you "first in line" to receive the discounts your participation authorizes us to negotiate. It costs you nothing. Zero risk. Read it. Complete it. Submit it. The time is NOW! An unfortunate American without health insurance goes to the emergency room. Without insurance, he is a single payer. Single payers pay list price. And, list price is expensive. Very expensive. Many independent audiologists in the United States are single payers to manufacturers. They do not get the same prices as the big-box stores or chains. We are doing something about that! An Audiology Provider Organization (APO) functions like an HMO or PPO. It is a "cost" management program where individual independent audiology practices pool their purchasing power into a single purchasing organization. This organization then negotiates prices based on the thousands of orders its members represent. The entire negotiated price is passed through to each member practice. No percentage is held back. Want to learn more? Register for one of our upcoming APO Webinars where you can get more details and engage in the debate. Just click below to register. Is Your Practice Listed on NowiHear.com's "Audiology Practice Locator"? According to Pew Research, 74% of American adults go online, and 61% of those adults look online for health information. Most of these "e-patients" claim that they or someone they know has been helped following the health information found on the Internet. Having a practice website is essential. But, linking to a "Tower Website" is THE most effective way to get your information found by searchers on the internet. AuDNet's consumer information website - NowiHear.com - gets found by nearly 10,000 people each month looking for hearing health care information. And this number keeps growing The NowiHear.com SEO and sponsored link investments far eclipse the resources of any single audiology practice. And, since this website is focused on promoting the value and expertise of audiology care, once e-patients reach NowiHear.com, they learn to "ask for an audiologist!" To find the audiologist in their area, NowiHear.com visitors can click on the unique "Audiology Locator" tool. Once they type in their zip code, they receive an exclusive listing of audiology practices in their area. These locator listings connect visitors directly to individual practice websites, videos, phone numbers and address information. A Priority Listing give practices "top billing" on results pages. Member audiology practices listed on the NowiHear.com Audiology Locator enjoy hundreds of exposures each month to their practice information and website. And, by clicking on the practice listing, new patients make direct contact with the audiology practice and its website. Securing a listing on the NowiHear.com Audiology practice Locator is simple. Simply download, complete and fax back the enrollment form below. Create a link to NowiHear.com on your website. Benefit from the constant new and fresh information about audiology care posted on the site. Make it easy for patients in your area to find you on the Internet. Don't miss this proven way to multiply your Internet visibility and value.